Exhibit gallery text by Jeff Burbank. All photographs courtesy of UNLV Special Collections. 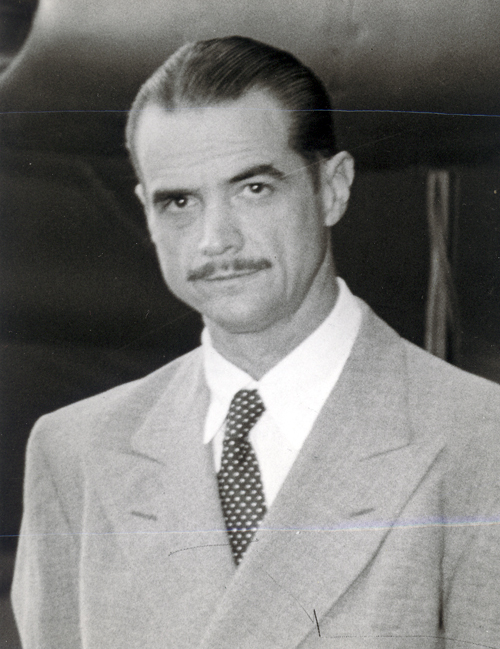 For further information see Jeff Burbank's article on Howard Hughes. 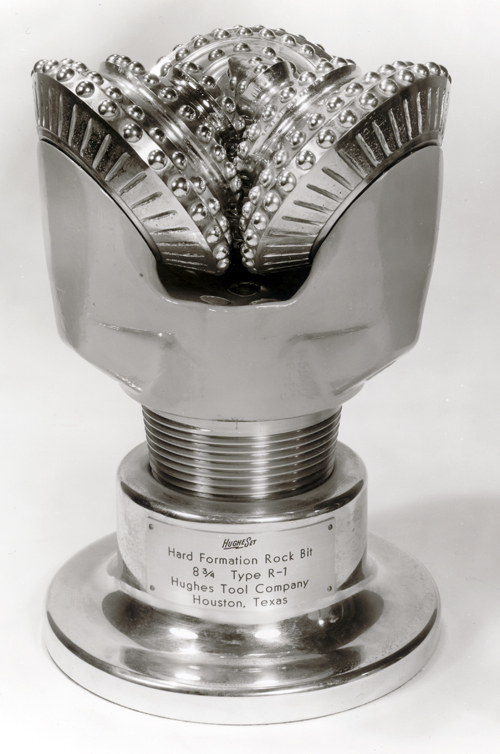 A shining facsimile of a drill bit, modeled after the Hughes Tool Company hard formation rock bit type R-1, was fashioned into a trophy for display, circa 1950. The two-cone rotary drill bit was patented by Howard Hughes’s father, Howard Hughes, Sr., for the Sharp-Hughes Tool Company, in Texas, in 1909. The bit soon became famous for oil production because it bored into hard rock far better and faster than any other bit. The invention made the Hughes family, of Texas, vastly rich. When Hughes, Sr. died in 1924 at age fifty-four, the nineteen-year-old junior Hughes inherited the family fortune and took over the business, renaming it the Hughes Tool Company. 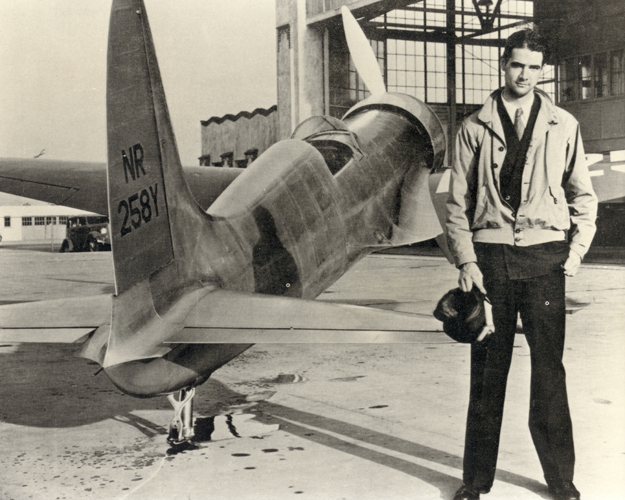 A young Hughes, about twenty-nine, stands in front of the H-1 Racer aircraft he built in 1935. The H-1 was the first plane produced by his fledgling Hughes Aircraft Company. That year, he flew the aluminum-skin plane in Santa Ana, California, and reached 352 mph, thought at the time to be the world’s record speed over land. The H-1, which some later claimed was the model for several World War II fighter planes, was donated for display to the Smithsonian Air and Space Museum in 1975. 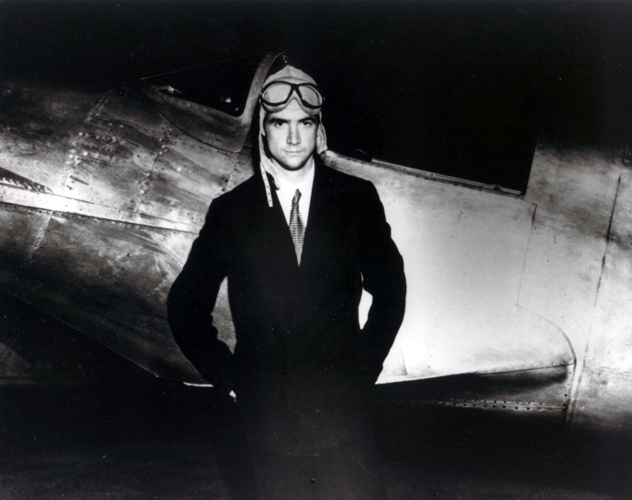 On the evening of January 1, 1936, Hughes stood beside his racer plane, the Northrop Gamma. After setting a short-distance speed record in his H-1 Racer craft in Santa Ana, California, in September 1935, Hughes was bent on establishing a record for long-distance flight across the United States. He sought out the single-engine Gamma, owned by well-known racing aviatrix Jackie Cochran, who relented after Hughes offered her a large sum for it. Hughes replaced the plane’s engine and took off from Burbank, California, on January 16, 1936, headed east. He flew across the continental United States, landing in Newark, New Jersey, only nine hours and twenty-seven minutes later, earning a new record for cross-country flying. He would set two other airplane speed records in the United States that year. 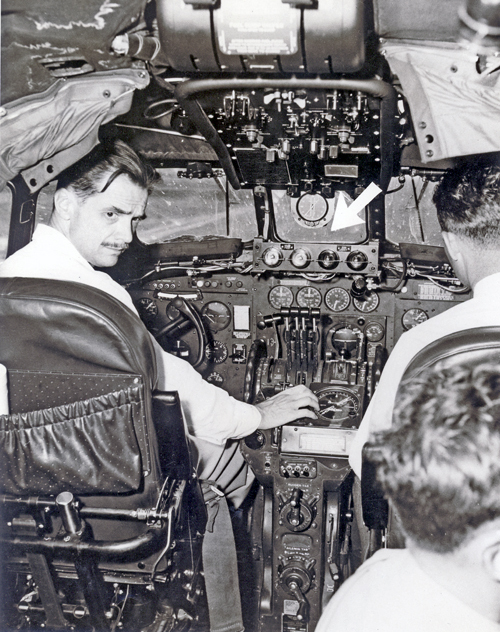 In April 1946, Hughes checked out the controls in the cockpit of the XF-11, a reconnaissance plane he designed for the U.S. Army Air Force. On July 7 of that year, Hughes nearly died when his plane crashed during a test flight due to a propeller malfunction. He attempted to land on a golf course, but the plane hit three houses in Beverly Hills, California, and burst into flames. Hughes survived after suffering severe burns, broken bones, and serious injuries to his heart and lungs. Hughes later developed an addiction to the painkillers that were used to treat him for the injuries, and he grew his well-known mustache to hide a scar on his face that resulted from the crash. 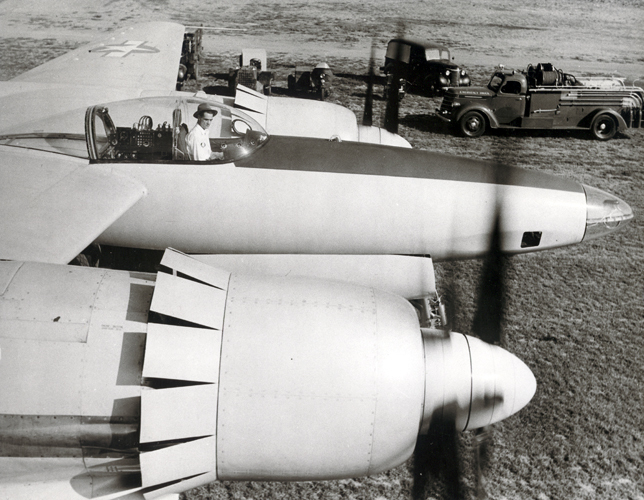 From the cockpit, Hughes tests the counter-rotating propeller engines of the XF-11 reconnaissance plane he designed for the U.S. Army Air Force in April 1946. On July 7, 1946, one of the counter propellers failed during Hughes’s test flight of the craft, sending the plane into a dive. Hughes was badly injured when the plane crashed into a neighborhood in Beverly Hills, California. On May 1, 1947, Hughes assessed the new radar safety device (see arrow) of a Lockheed Constellation, a groundbreaking, propeller-driven plane that Hughes encouraged Lockheed to build in the early 1940s for his Trans World Airlines. Hughes had himself flown a Constellation from California to Washington, D.C., in 1944. In February 1946, shortly after World War II ended, Hughes’s Trans World Airways, using a Constellation, became the first commercial airline to fly an intercontinental flight, from New York to Paris. In August 1947, Hughes posed after piloting a B-29 plane across the country to testify before the Senate War Investigating Committee in Washington, D.C., which was probing allegations that Hughes failed to complete construction of a military transport plane for the U.S. government during World War II. Hughes denied the charges in a heated exchange with the committee’s chairman, Senator Owen Brewster, Republican from Maine, and ultimately won public support. 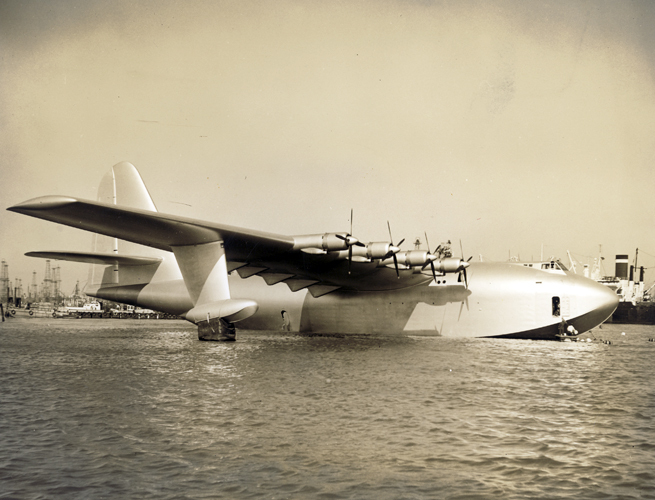 The prototype Hughes H-4 Hercules, also known as the “Spruce Goose” and “Flying Boat,” sits in a boat dock in Los Angeles Harbor for servicing prior to its one-and-only flight by Hughes on November 2, 1947. The massive plane was made almost completely of glued birch wood due to the shortage of aluminum and other metals during World War II. It was designed to transport military troops overseas by air as a safer alternative to transport by ship. 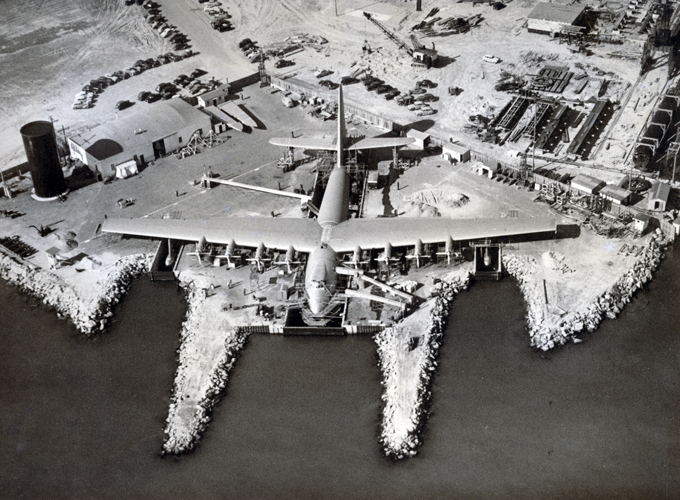 An aerial shot of the Hughes H-4 Hercules plane, then considered the largest plane ever built, parked on three concrete docks for its fuselage and wings. 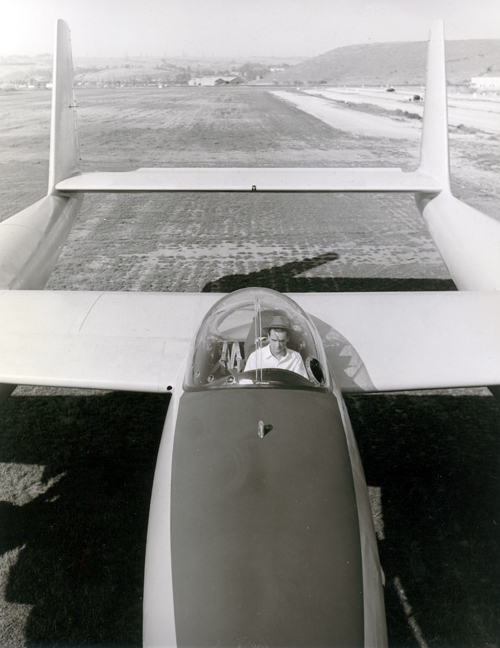 The plane’s wingspan was huge – 320 feet, longer than a football field. The idea for the plane came from Henry J. Kaiser, a shipbuilder, who teamed with plane-builder Hughes in the early 1940s to construct a military transport aircraft able to fly about 750 soldiers across the Atlantic Ocean. Kaiser, tired of the delays in development, left the project well before the plane’s only flight in late 1947. 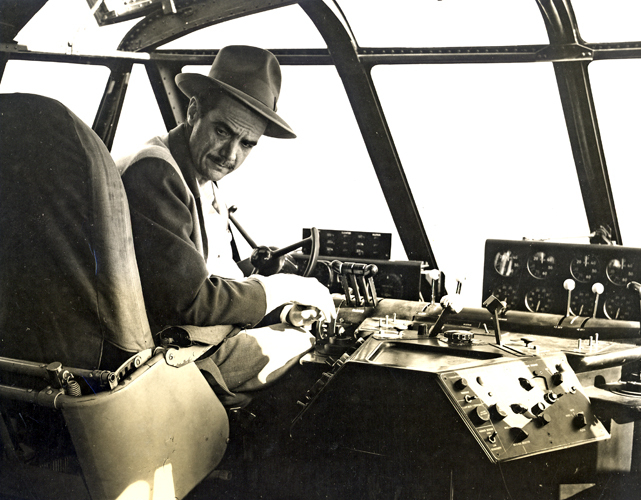 Hughes, donning a fedora hat, turns to face the camera from the pilot’s seat of the Hughes H-4 Hercules plane, or “Spruce Goose,” as he prepared to taxi the floating plane on the surface of Los Angeles Harbor before taking it on its short, one-mile flight on November 2, 1947. 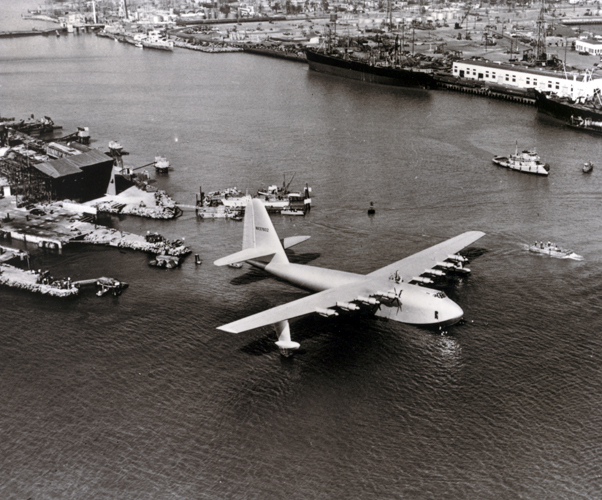 On November 2, 1947, the Hughes H-4 Hercules made its way into Los Angeles Harbor for what would be its only flight. On board with pilot Hughes were about thirty other people, including co-pilots, crew, invited guests, and news reporters. An aerial view of the first launch of the Hughes H-4 Hercules on November 2, 1947, as pilot Hughes prepared it for a test run on Los Angeles Harbor. 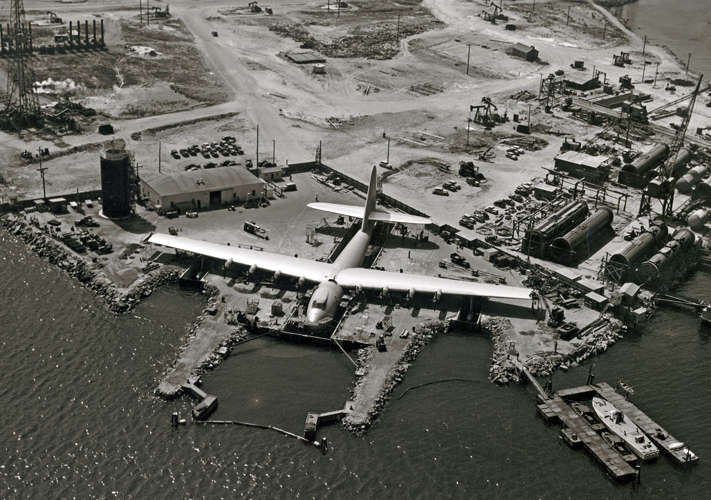 After seawater was pumped into the dock, tractors pulled the plane off of the blocks, and then boats towed the plane into the harbor by the pontoons located on its wings. 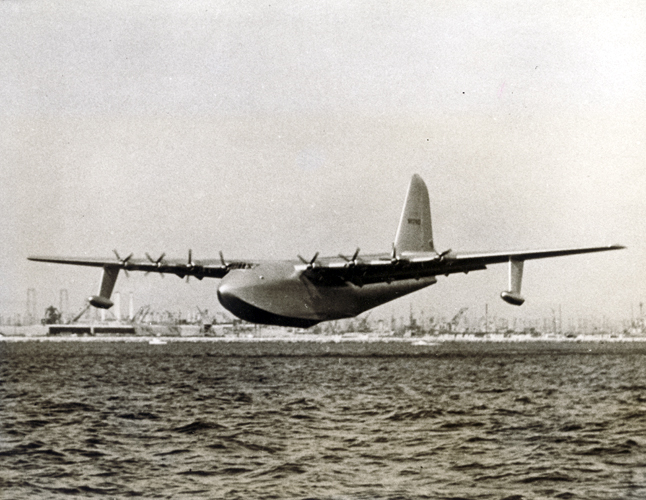 On November 2, 1947, Hughes succeeded in getting his massive H-4 Hercules plane airborne about seventy feet above Los Angeles Harbor, near Long Beach, California. The brief flight, the only one the plane would have, extended about one mile. Although the craft’s underpowered engines, coupled with its broad wingspan, may have made it difficult for Hughes to stay in the air, Hughes proved to skeptics that his Flying Boat could indeed fly. Hughes employed a staff to maintain the H-4 inside a private hangar for decades, all the way up to his death in 1976. In 1993, the Flying Boat was sent for restoration, and eventual display, to the Evergreen Aviation Museum in McMinnville, Oregon. 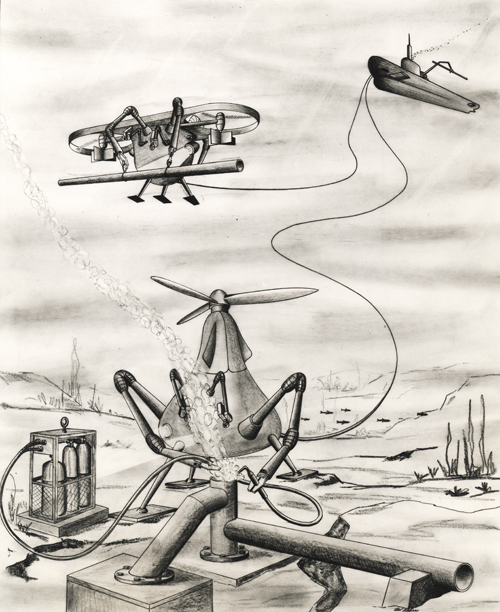 Undersea futuristic MOBOTs, short for Manipulated Operated Robots, invented in the late 1950s by the Hughes Tool Company, are depicted in an artist’s drawing. The Hughes-produced MOBOT was originally intended to handle dangerous radioactive material on land by remote control, using a two-hundred-foot cable and television cameras for “eyes.” In the early 1960s the MOBOT was modified for marine use underwater, replacing human divers to perform difficult work on offshore oil rigs.